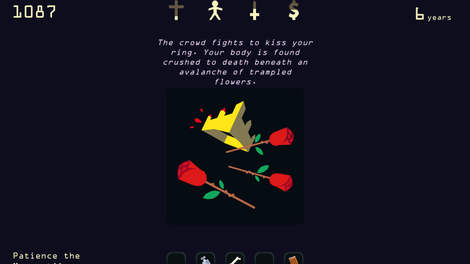 In my time as queen in Reigns: Her Majesty, I was torn apart by my subjects, eaten by wolves, and burned at the stake. I had affairs with pagan women, barbarian queens from other lands, and rakish explorers of new worlds. I was coronated again and again, born anew to rule once more. You’re always the queen, even if it kills you. 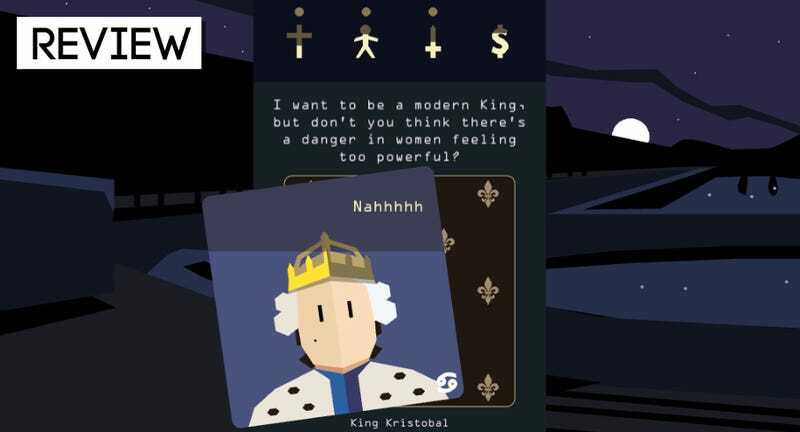 Reigns: Her Majesty is a sequel to last year’s Reigns, and, like its predecessor, it’s a game of diplomacy that plays like swiping through Tinder. 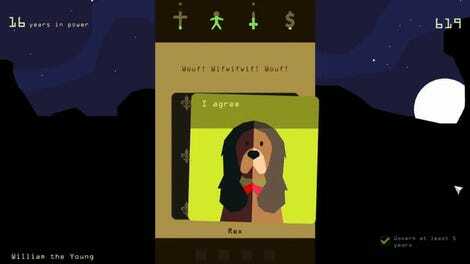 (Reigns: Her Majesty was written by my friend and former Kotaku contributor Leigh Alexander.) You play as the queen of a medieval kingdom, and you rule by swiping left or right on cards with choices on them. Your choices affect your popularity with the church, the people, your army, and your treasury. If things get too low in any category, you’ll die. If things max out in any category, you’ll also die, and these deaths can be kind of funny. If you’re too popular with the people, they’ll trample you to death while trying to give you gifts. If your army is too strong, your king gets paranoid and sends you to a locked tower for your safety, where you go mad and die. In the original Reigns you were the king, and in this one, you’re the queen. Being Queen comes with its own sets of hurdles. No one in your court really expects you to rule or wield any power, but you end up picking up the slack from your husband anyway. Have fun with the occasional backhanded compliment. What you wear sets fashion trends, and also possibly pisses off the church. There’s also witchcraft—a ton of witchcraft—which you can be burned for if the church doesn’t like you very much. In the last game, your never-ending rule was a curse from the devil. Here, it’s a gift bestowed to you by the All-Mother, a pagan god whose worshippers you meet in-game. The kinds of magic that are traditionally associated with womanhood, earth worship and witchcraft are all over this game. You can even get a magic mirror, like some kind of evil step mother. "It's like they stuck a bitter girls-only happy hour in a mobile game." Four hours of swiping, discovering 493 cards, 33 character portraits and dying many, many times. I sometimes groan through media about women, but I smirked my way through Her Majesty. Some of the writing in the game seemed plucked out of my life, or lightly hinted at experiences I’ve had as a woman that are super annoying. You can meet a group of snake-masked cultists who bemoan that women gaining power is ruining the country. At one point, they just hiss at you, I guess for existing. You also can meet a wise old owl, who will tell you some made up statistics about how you’re playing the game. “82 percent of women gave this answer, twit-twoo!” the owl will say. “Consensus may mean you’re on the ideal path to empowerment!” Once, the owl told me, “Nice answer! You results indicate that your Feminist Goddess Soul is Harry Potter!” and I chuckled. In small ways, you keep getting asked to justify and defend your existence as a woman. If you play dumb or acquiesce to the constant pressure, you’re belittled and talked down to. If you defend yourself, you’re insulted more directly. Once I asserted my ability to make my own choices to another character and that character laughed at me. I had a brief acid flashback to some really terrible college classes after that one. Her Majesty isn’t one of those stories about women that’s meant to empower them by showing a rise out of adversity. It’s more a fun friend, laughing with you about all the irritating little things that happen to you when you’re a woman that other people sometimes don’t believe. There isn’t a right or wrong way to be a queen in Her Majesty, because you’re going to die anyway. Your many advisors will tell you how to think and how to be, but in the end it doesn’t matter much. Your best hope is that you die well, for even your deaths will be remembered. Queen Desdemona’s death was “forever a topic of dissertation.” Queen Roxanne became an “icon to disobedient women.” There were two deaths I only got once. In my first game, I died in childbirth. Many games later, I lived until 41, where I died of old age, remembered as a great queen and a fine royal wife. That, I suppose, contains the entire spectrum of what a woman’s life can be.